Saint Ignatius of Loyola, also known as Ignacio (Íñigo) López de Loyola (December 24, 1491 – July 31 1556), was a Spanish theologian and one of the most influential figures in the Catholic Reformation of the sixteenth century. After a spiritual conversion during his convalescence from wounds sustained in battle, he determined to emulate Christ as closely as possible, and began a life of extreme asceticism and prayer. The result was the Spiritual Exercises, a guide to meditation and prayer which is still used by Catholics and Protestants today to enhance their spirituality. He was founder and first Superior General of the Society of Jesus, commonly known as the Jesuits, confirmed by a papal bull in 1540. Ignatius and the early Jesuits recognized that the hierarchical Church was in dire need of reform, and some of their greatest efforts were against the corruption, venality, and spiritual lassitude within the Catholic Church. The Jesuit Constitutions, written by Ignatius Loyola and published in 1548, included a vow against seeking ecclesiastical honors and insisted on a high level of academic preparation for ministry. Ignatius also rejected some of the traditional forms of the religious life, such as physical punishments and the wearing of a distinctive religious habit, in favor of greater adaptability and mobility. His Spiritual Exercises emphasized development of “discernment,” the individual’s ability to discern good from evil in order to choose the right course of action. By the time of Ignatius’ death in 1556, the Jesuits were already operating a network of 74 colleges on three continents, whose curriculum incorporated the classical teachings of Renaissance humanism into the Scholastic structure of Catholic thought. He also sent missionaries to Germany, India, Brazil and the Congo region. Ignatius was canonized on March 12, 1622. His feast day is July 31. He is the patron saint of Guipúzcoa as well as of the Society of Jesus. Ignatius was born Íñigo on December 24, 1491 at the ancestral castle of Loyola, in the municipality of Azpeitia, 16 miles southwest of Donostia/San Sebastian in the Basque province of Guipúzcoa, Spain. The youngest of 13 children of a noble and wealthy family, Ignatius was only seven years old when his mother died. In 1506, Íñigo became a page in the service of a relative, Juan Velázquez de Cuéllar, treasurer (contador mayor) of the kingdom of Castile. In 1517 Ignatius became a knight under another relative, Antonio Manrique de Lara, duke of Nájera and viceroy of Navarre. He participated in the defense of the small town of Pamplona against the recently expelled (1512) Navarrese monarchy, who took refuge in Basse-Navarre, a part of Navarre that did not surrender to the Spanish army and is an actual part of France. Greatly outnumbered, the Spaniards wanted to surrender, but Ignatius persuaded them to fight on. One leg wounded, the other broken by a cannonball, Ignatius was returned to his castle by the Navarrese. This event ended a period of his life during which, in his own words, he was, “a man given to the vanities of the world, whose chief delight consisted in martial exercises, with a great and vain desire to win renown” (Autobiography, 1). The young Ignatius was described as a proud man, standing just under five feet two inches in height, with abundant red hair, who delighted in music and sacred hymns. After being given medical treatment at Pamplona, Ignatius transported back to Loyola in June of 1521. His condition became so serious that he was not expected to survive. When he began to regain his strength, he decided to undergo surgery to correct the misalignment of his broken leg. During the time he was recovering, Ignatius read a number of religious texts on the life of Jesus and the saints. His copy of the lives of the saints contained prologues written by a Cistercian monk who represented the service of God as a holy chivalry. Ignatius became fired with an ambition to lead a life of self-denying labor and emulate the heroic deeds of Francis of Assisi and other great monastic leaders, and resolved to devote himself to the conversion of non-Christians in the Holy Land. Upon his recovery, in February of 1522, Ignatius left his family and went to the Benedictine monastery of Montserrat, where he spent three days confessing the sins of his entire life; hung his military vestments, sword and dagger near the statue of the Virgin Mary as a sign of his abandoned ambitions; and, wearing sackcloth, spent the night of March 24 in prayer. The next day he went to Manresa, Catalonia, a town 30 miles from Barcelona, where he spent the decisive months of his career, from March 25, 1522, to mid-February 1523, in a cave practicing the most rigorous asceticism. He remained at the ascetic Collège de Montaigu for over seven years, living as a beggar, eating and drinking sparingly, scourging himself, attending mass daily and spending hours in prayer. During this period of spiritual trials and enlightenment, Ignatius sketched out the fundamentals of his devotional book, The Spiritual Exercises, which he continued to work on until the end of his studies in 1535. In March of 1523, Ignatius left Barcelona on a pilgrimage to the Holy Land. He traveled through Rome, Venice, and Cyprus, reaching Jerusalem on September 4. There, the Franciscan custodians of the shrines of the Latin church refused to allow him to stay permanently. Ignatius visited Bethany, the Mount of Olives, Bethlehem, the Jordan River, and Mount of Temptation, and returned Barcelona in March of 1524. Ignatius decided to acquire the best possible education, believing that a well-trained man could accomplish much more in a short period of time than an uneducated man would accomplish in a lifetime. He was already 33 years old and ignorant of Latin, a necessary prerequisite for study at a university. For two years he studied Latin grammar with young boys in a school in Barcelona, then entered the University of Alcala in 1526. There, he began to explain the Gospels to gatherings of students and adults, and teach them how to pray. He attracted a small group of followers who wore distinctive clothing. Since he was not an ordained priest, he was suspected of heresy, arrested by the Inquisition and imprisoned for 42 days. He was found innocent, but was warned to stop his religious teaching of others. He moved to the University of Salamanca, and after two weeks he was imprisoned again, this time along with his followers. He was again acquitted, but was forbidden to teach anything but the most simple spiritual truths to young children. Unwilling to accept these restrictions, Ignatius left Spain and went to the University of Paris, where he remained as a student until 1535, living on alms. In 1528 and 1529 he went to Flanders to beg from Spanish merchants there, and in 1530 he visited England for the same purpose. In Paris he gathered another group of followers, whose unusual attire and behavior again attracted the unwelcome attention of the authorities. On one occasion Dr. Govea, the rector of Collège Sainte-Barbe, sentenced him to a public flogging, but when he explained himself, the rector publicly apologized. He was called before the Inquisitors once, but the proceedings were dropped when he demanded an immediate sentence. This incident convinced him that it would be prudent to withdraw from public religious activities until he was ordained a priest. He also realized that in a city environment it was impractical to practice severe asceticism, such as exterior mortification, going barefoot, fasting, and begging for alms. He adapted the dress and habits of his followers to the life of the town, and placed more emphasis on studies and spiritual exercises. In Paris, Ignatius finally achieved a coveted Master of Arts at the Collège de Sainte-Barbe. Although his name, Íñigo, was actually Basque for Ennecus or Innicus, in later life he was often called "Master Ignatius" in recognition of his final academic credential. By 1534 he had six key companions, all of whom he met as students at the University—Francis Xavier, Alfonso Salmerons, Diego Laynez, and Nicholas Bobadilla, all Spanish; Peter Faber, a Frenchman; and Simão Rodrigues of Portugal. They shared his ideal of leading a life as similar as possible to Christ's in the Holy Land. They were joined soon afterwards by three others, Claude Le Jay, a Genevan Savoyard; Jean Codure and Paschase Broët, French. On August 15, 1534, he and the other six in Saint Mary's Church, Montmartre, founded the Society of Jesus "to enter upon hospital and missionary work in Jerusalem, or to go without questioning wherever the pope might direct." They took vows of poverty and chastity, and a third vow to go to the Holy Land after two years, when their studies were completed. Six months later, in 1535, bad health compelled Ignatius to return to his native country, after which he made his way slowly to Bologna. There, still unable to study because of ill health, he devoted himself to active works of charity until his companions could join him in Venice for their journey to the Holy Land. When his companions arrived in Venice in January, 1937, they were unable to proceed any further because of war with the Turks, and decided to wait one year and put themselves at the Pope’s disposal. At Lent, Faber and some others traveled to Rome and got papal approval for their order. Pope Paul III confirmed the order through the bull Regimini militantis (September 27, 1540), but limited the number of its members to 60. This limitation was removed through the bull Injunctum nobis on March 14, 1543. The term "Jesuit" (of fifteenth-century origin, meaning one who used too frequently or appropriated the name of Jesus), was first applied to the Society in reproach (1544-1552), and was never employed by its Ignatius, though members and friends of the Society in time appropriated the name in its positive meaning. Ignatius was chosen as the first Superior General of his religious order, invested with the title of "Father General" by the Jesuits. He sent his companions as missionaries around Europe to create schools, colleges, and seminaries. Juan de Vega, the ambassador of Charles V, Holy Roman Emperor at Rome, had met Ignatius there. Esteeming him and the Jesuits, when Vega was appointed Viceroy of Sicily he brought Jesuits with him. A Jesuit college was opened at Messina; it was notably successful, and its rules and methods were afterwards copied in other colleges. In 1548 his book Spiritual Exercises was finally printed, and he was briefly brought before the Roman Inquisition, but was released. In 1546, Ignatius secretly received Francis Borgia, duke of Gandía and viceroy of Catalonia, into the Society. This created a public sensation when it became known four years later. Borgia organized the Spanish provinces of the order and became its third General. At first, Ignatius was hesitant about placing the Jesuit brothers in colleges as teachers, but he soon came to realize the effectiveness of educational institutions as vehicles of his religious ideals. In his last years he laid the foundation for a system of schools which made the Jesuits largely a teaching order. When King John III of Portugal sought diligent priests to evangelize and minister to Christians in his new Asian opinions, he called on Ignatius, and in 1540, Francis Xavier was dispatched to India as the first of many Jesuit missionaries. Beginning in 1541, Ignatius began to consider certain customs and traditions which later became essential characteristics of the Jesuit order. In 1547, with the help of his secretary, he began to write the Jesuit Constitutions, adopted in 1554 and later subjected to minor changes. While serving as the first Father General of the Jesuits, Ignatius suffered from frequent illnesses. In January of 1551, he became seriously ill and asked his associates to accept his resignation, but they refused, and he continued to direct the order until his death He died in Rome on July 31, 1556 after a long struggle with chronic stomach ailments. 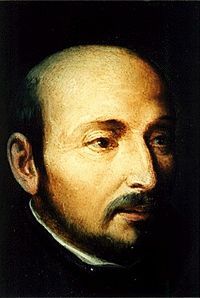 Ignatius Loyola’s two most important works are Spiritual Exercises, written in 1522-1523 and published in 1548; and The Constitutions of the Society of Jesus (1554). During 1553-1555 Ignatius dictated his life's story to his secretary, Father Gonçalves da Câmara. This autobiography is a valuable key for the understanding of his Spiritual Exercises. It was kept in the archives for about 150 years, until the Bollandists published the text in Acta Sanctorum. A critical edition exists in Vol. I (1943) of the Fontes Narrativi of the series Monumenta Historica Societatis Iesu. The Spiritual Exercises of Ignatius of Loyola, written within 1522-1523 during his own spiritual retreat in the cave at Manresa, are a brief set of meditations, prayers and mental exercises, designed to be carried out over a period of 28 to 30 days and intended to enhance and strengthen religious faith. Ignatius made additions to it until 1935, during his studies in Paris, and a few minor changes before it was approved for publication by Pope Paul III in 1548. During his lifetime, Ignatius used it to guide others, especially his followers, during spiritual retreats. The book became a cornerstone of Jesuit spirituality, and a component of the Jesuit novitiate program. The Exercises were designed to be carried out in seclusion, but in his introductory notes Ignatius also provided a model for completing the Exercises over a longer period without the need of seclusion. The Exercises were designed to be carried out while under the direction of a spiritual director. Ignatius considered the examen, or spiritual self-review, to be the most important part of the Exercises. Ignatius' innovation was to make this style of contemplative mysticism available to all people in active life, and to use it as a means of rebuilding the spiritual life of the Church. The Exercises became both the basis for the training of Jesuits themselves and one of the essential ministries of the order: giving the exercises to others in what became known as retreats. The Exercises is divided into "four weeks" of varying lengths with four major themes: sin, the life of Jesus, the Passion of Jesus and the Resurrection of Jesus. Daily instructions include various meditations and contemplations on the nature of the world, of human psychology as Ignatius understood it, and of man's relationship to the God of Jesus Christ. During each day, a typical retreatant prays with a particular exercise, as assigned by the director, reviews each prayer, and, after four or five periods of prayer, reports back to the spiritual director of the retreat, who helps him to understand what these experiences of prayer might mean. In Ignatius' Spiritual Exercises, God and the Devil are presented as active players in the world and in the human psyche. The main aim of the Exercises is the development within the human psyche of "discernment" (discernio), the ability to discern between good and evil spirits, in order to act "with the Grace of God." There is an acknowledgement that the human soul is continually drawn in two directions: towards Godliness, and at the same time tempted towards baseness. In this context, the retreatant is directed to reflect on humility, selflessness for the sake of the religious life, and the tendency to fall into sin. The Exercises provide several illustrations of how to refrain from satiating one's lower desires and redirect one's energies towards the fulfillment of a higher purpose in life. In Jesuit thought, "discernment," while on the one hand being an action of mysticism, can also be understood as a method of subjective ethical thought. The Exercises emphasize the role of ones own "discernment" in deciding what is the path to glorify God (the right path). "Discernment" attempts to make a direct connection between the individual’s thought and action and the Grace of God. The concept of “discernment” potentially emphasizes the mystical experience of the believer, independent of church hierarchical authority. This aspect of the spiritual exercises is typical of the mysticism in Catholic thought and practice which both preceded the Reformation, and lived on within elements of Counter-Reformation Catholicism. The Jesuits were a major factor in the Counter-Reformation, and at times in history, progressive Jesuit action has brought the order into conflict with conservatives in the hierarchy. The Spiritual Exercises remain an integral part of the Novitiate training period of the Roman Catholic religious order of Jesuits. Many local Jesuit outreach programs throughout the world employ the Exercises in retreats for the general public. Beginning in the 1980s, Protestants have taken a growing interest in the Spiritual Exercises, and recent (2006) adaptations specific to Protestants emphasize the exercises as a school of contemplative prayer. The Exercises is still undertaken in its original form over a period of thirty days. Ignatius began work on the Jesuit Constitutions in 1541. Except for the use of a few stock phrases, his work was entirely original and he made no reference to the constitutions of other religious chapters. He renounced a chapter government by members of the order and instead stressed absolute self-abnegation and obedience to Pope and superiors. His main principle became the Jesuit motto: Ad Maiorem Dei Gloriam ("for the greater glory of God"). In favor of greater adaptability and mobility, he rejected some of the traditional forms of the religious life, such as chanting the divine office, physical punishments, and the wearing of a distinctive religious habit. He increased the training period for novitiates, allowing them to enter simple vows at first and more solemn vows much later, and making it easier to separate from the order. After some consideration, he decided that women were best directed by women, and rejected a female branch of the order. The Jesuit order is said to have been the first order to officially undertake, in the articles of its constitution, the education of youth of all classes, the instruction of the ignorant and the poor, ministry to prisoners and the sick, and foreign missions at the Pope’s bidding. At the time of Ignatius Loyola’s death, the Jesuit order had grown to about one thousand Jesuits, divided into 12 “provinces” (administrative units), three in Italy, three in Spain, two in Germany, one in France, one in Portugal, one in India and one in Brazil. Ignatius had sent Francis Xavier to India and Peter Canisius to Gemany, and had dispatched missionaries to Ethiopia and the Congo region. As they developed, the Jesuits concentrated on three activities. They founded schools throughout Europe, with Jesuit teachers rigorously trained in both classical studies and theology. The Jesuits' second mission was to convert non-Christians to Catholicism, by developing and sending out missionaries. Their third goal was to stop Protestantism from spreading. When Ignatius died in 1556, the Jesuits were already operating a network of 74 colleges on three continents. A precursor to liberal education, the Jesuit plan of studies incorporated the Classical teachings of Renaissance humanism into the Scholastic structure of Catholic thought. Ignatius and the early Jesuits recognized that the hierarchical Church was in dire need of reform, and some of their greatest efforts were against the corruption, venality, and spiritual lassitude within the Catholic Church. Ignatius's insistence on an extremely high level of academic preparation for ministry, for instance, was a deliberate response to the relatively poor education of much of the clergy of his time, and the Jesuit vow against seeking ecclesiastical honors was a deliberate effort to prevent greed for money or power from invading Jesuit circles. In Rome, Ignatius founded the Roman College, which later became the Gregorian University, and the Germanicum, a seminary for German candidates for the priesthood. He also established a home for fallen women and one for converted Jews. Ignatius was beatified by Paul V on July 27, 1609, and canonized by Gregory XV on May 22, 1622. His feast day is celebrated annually on July 31, the day he died. Saint Ignatius is venerated as the patron saint of Catholic soldiers, the ordinariate of the Philippine military, the Basque country, and various towns and cities in his native region. On April 22, 2006, Feast of Our Lady, Mother of the Society of Jesus, Pope Benedict XVI said that "St Ignatius of Loyola was above all a man of God, who gave the first place of his life to God, to his greater glory and his greater service. He was a man of profound prayer, which found its center and its culmination in the daily Eucharistic Celebration. In this way he left his followers a precious spiritual inheritance that must not be lost or forgotten. As a man of God, St Ignatius was a faithful servant of the Church, in which he saw and found the spouse of the Lord and the mother of Christians. And from the desire to serve the Church in a more useful and effective way was born the vow of special obedience to the Pope, who he classified as "our first and principal foundation" (Constitutions of the Society of Jesus, I, 162)." ↑ Address of Benedict XVI to the Jesuits, April 22, 2006. Retrieved July 20, 2007. Loyola, (Saint) Ignatius (1992). The Autobiography of St. Ignatius Loyola, with Related Documents. (J. F. O'Callaghan, Trans). New York: Fordham University Press. ISBN 082321480X. Caraman, Philip. 1990. Ignatius Loyola: A Biography of the Founder of the Jesuits. San Francisco, CA: Harper & Row. ISBN 0062501305. Meissner, William W. 1992. Ignatius of Loyola: The Psychology of a Saint. New Haven, CT: Yale University Press. ISBN 0300060793. O'Malley, John W. 1993. The First Jesuits. Cambridge, MA: Harvard University Press. ISBN 0674303121. English translations of Ignatius' two most important works are The Spiritual Exercises of St. Ignatius, trans. by L. J. Puhl, 1951; and The Constitutions of the Society of Jesus, Translated, with an Introduction and a Commentary, by G. E. Ganss, 1970. Ganss, George E., S.J. 1992. The Spiritual Exercises of Saint Ignatius: A Translation and Commentary. Chicago: Loyola Press. ISBN 0829407286. Mottola, Anthony. 1964. Spiritual Exercises of Saint Ignatius. Image. ISBN 0385024363. History of "Saint Ignatius of Loyola"
This page was last modified on 6 August 2015, at 20:47.